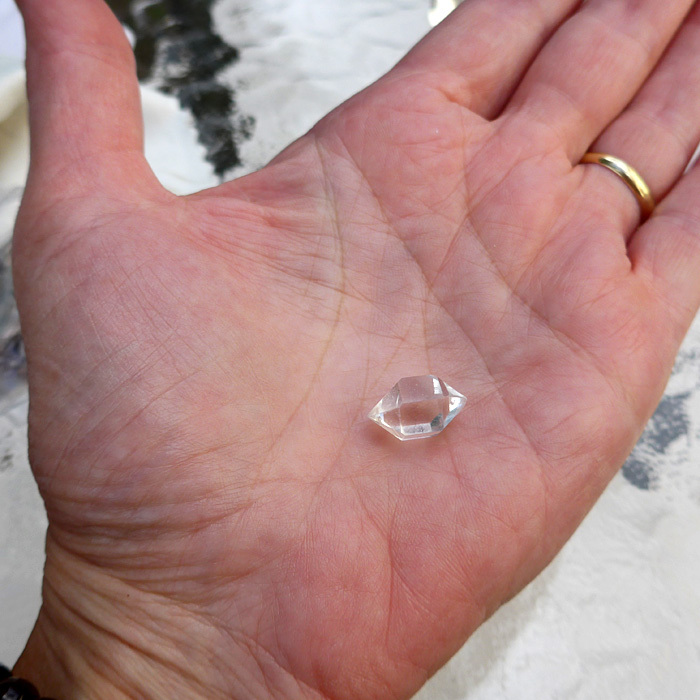 Dimensions (HxWxD): .6" x .4" x .4"
These virtually Water Clear natural, unpolished, uncut 5 carat Diamond Quartz gemstones exhibit a flawless surface and great brilliance. Diamond Quartz crystals are similar to the Herkimer Diamonds from upstate New York we are all familiar with, but they originate in Baluchistan, Pakistan. These beauties are $20 each. We will pick one for you out of this lot of 4. Or buy several if you like. Pakistani Diamonds are double-terminated quartz crystals with a hexagonal growth pattern that grow in cavities in the rock which often contain hydrocarbons and hematite. Pakistani Diamonds will grow abundantly in these cavities, creating a druzy carpet of beautiful crystals on the inside of the cavity, creating lovely geodes in some cases. The hydrocarbons and hematite in the areas where they grow often create dark inclusions in these beauties, so it is quite unusual to see Pakistani Diamonds like these with such clarity and bling. 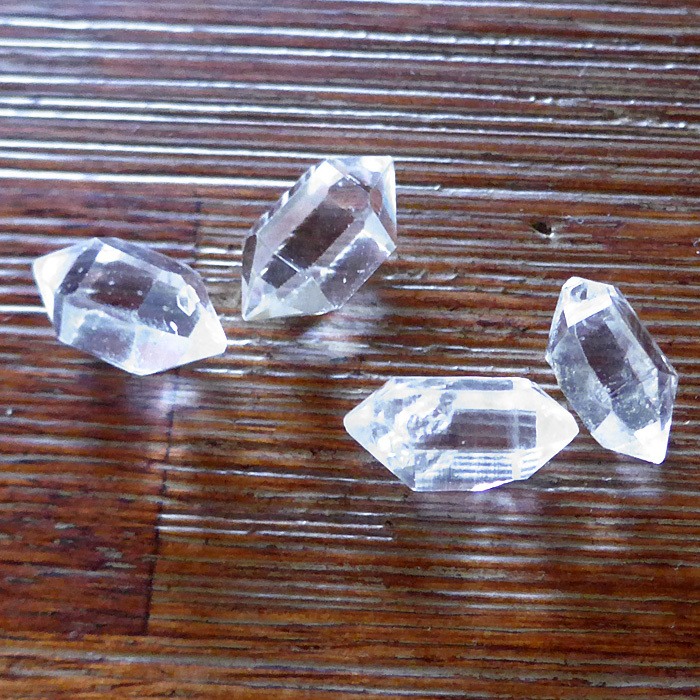 Diamond Quartz is an excellent meditation stone, with a very high frequency energy signature, known to lightworkers as an attunement stone. 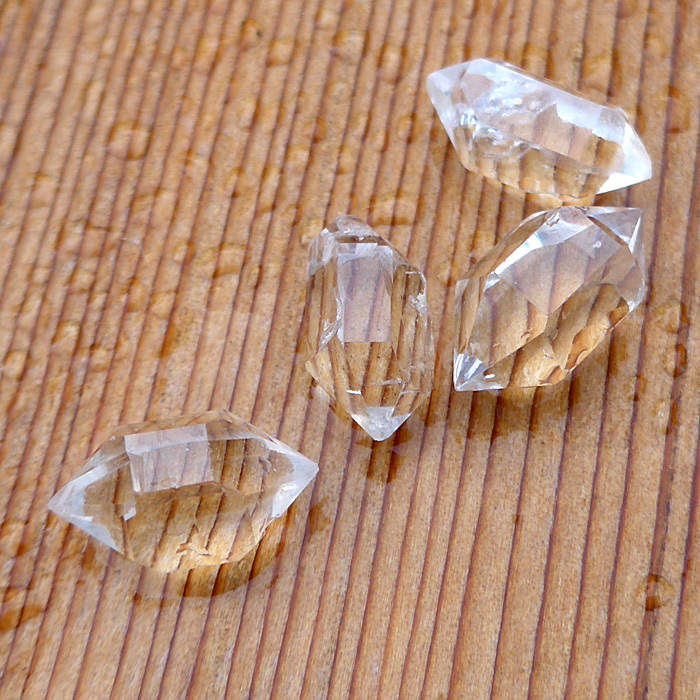 Two Diamond Quartz hexagonal stones can be used to attune the bearer to another person, environment or activity. 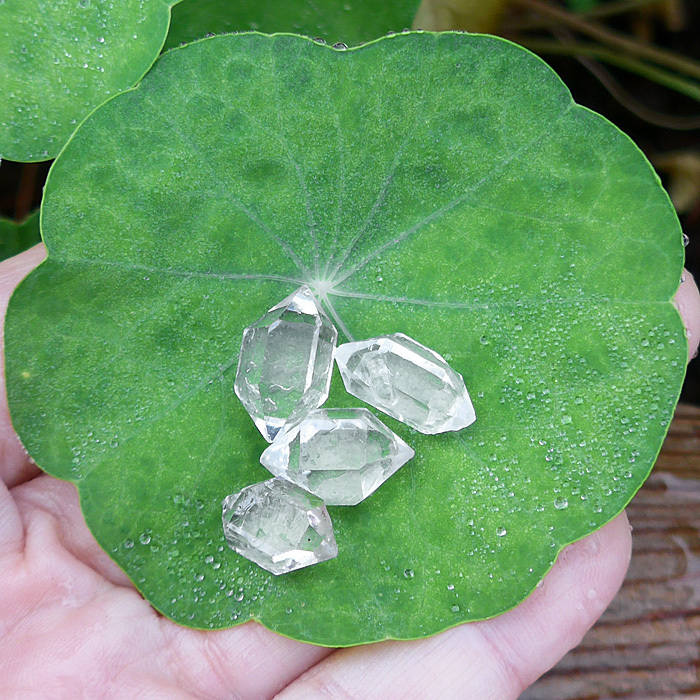 Place one Herkimer in one location and keep the other with you to maintain the attunement. Two Diamond Quartz stones can be held simultaneously by two people in a brief meditation, and when they each leave with one, the two will remain in attunement. This type of crystal transmits a very grounding, yet physically uplifting energy. Diamond Quartz can help in clearing mind and body of unconscious fears and other negative energies by stimulating the flow of prana throughout the physical and subtle bodies. They promote relaxation and energetic renewal. Note: Above weight is shipping weight, net weight is 5 carats.